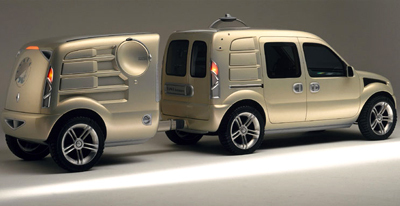 The Pangea concept which Renault revealed in 1997 was developed to help promote the production Kangoo van/MPV on which it was based. 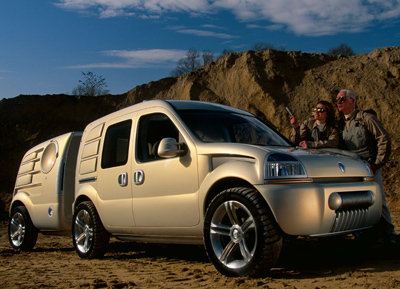 Except whereas the Kangoo has become known for being versatile and efficient - if perhaps a little dull, the Pangea concept is full of gimmicky little features which are completely pointless. The rear of the Pangea houses a 'laboratory and communications center' with external temperature, relative humidity and air quality sensors. A satellite antenna allows for communication from anywhere in the world. On the roof is a 360-degree panoramic camera for recording the surroundings. 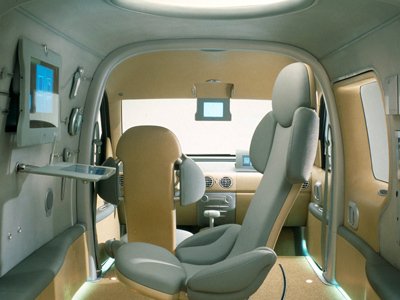 The Renault Pangea was powered by a hybrid drivetrain which used an LPG turbine to generate electricity for the batteries which in turn powered electric motors. The trailer housed the generator unit meaning the Pangea essentially towed its own refueling station.